Each Paladin brings diversity to the team but together, they form an amazing unit. Remember the episode in Season 7 where the Paladins end up on the Family Feud-like game show called Garfle Warfle Snick against the Galra? The Paladins are literally acting as a family – the Paladin family versus the Zarkon family. Even though this episode seems like a random break from the usual action, it lets us as the audience see just how the Paladins rely on each other — like family. Another episode that shows their family bond is Season 6’s Monster’s & Mana, a spoof on Dungeons & Dragons. We see the gang enjoying somewhat of a “family game night” together. First, let’s look at Pidge. She presents herself as a boy for the first few episodes of the first season. Why? Because she wants to get into the Galaxy Garrison Academy and find out what exactly happened to her father and brother who disappeared. At the end of Season 1 Episode 3, Return of the Gladiator, Shiro refers to her by her real name – Katie – but assures her that her secret is safe with him. Disguising her gender to defend her family — reminiscent of Mulan, no? She does eventually rescue her family. Another character worth looking at: Keith. At first, he has a hard time opening open to the rest of the team, most likely because he felt abandoned by his parents as a child. He doesn’t know much about his past, giving off the “lone wolf” vibe. We later discover in Season 2, however, that Keith is actually half-Galra via his mother, Krolia. Keith ends up embracing the rest of the Paladins and avenges them throughout the series. Next up: Princess Allura and King Alfor. Allura is the daughter of the creator of the Voltron lions, King Alfor, who clearly revered her above all else – hence, his plea for Allura to destroy his corrupted A.I. form in order to save the new Paladins. This father-daughter bond cannot be denied. There are many other examples, but you get the point. The theme of “family” is strong with this one…which kids and adults can both appreciate. The Voltron Fandom is undoubtedly loyal and the characters of VLD are easily relatable for both kids and adults. Shiro is the leader with an uncertain past. Hunk is the lovable, gentle giant and the “heart” of the team. In spite of his cockiness, Lance is the comedic relief. Keith is the lost soul, finding it hard to trust others. Often taking matters into her own hands, Pidge is the persistent one – always searching for the truth. Last but not least, Allura is fiercely loyal and incredibly smart. This array of personalities allows for everyone to find someone to relate to, thus strengthening the fandom. 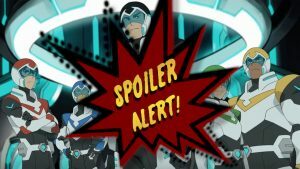 For the most part, fans are heartbroken, because in the very last episode, Allura sacrifices herself with a ritual to Honerva in order to restore the multiverse. To say she will be sorely missed is a massive understatement. What are your thoughts?! Did the writers wrap everything up in a nice bow? Do you think there will be a spinoff? Leave a comment below! I loved this show from start to finish! Super sad to see it end, but all good things must! Shiro and Adam were over the moment Shiro decided to still go on the mission. So that would make him his ex partner since Adam basically said “it’s either me or your mission.” I honestly am happy for Shiro, but I wish they wouldn’t kill Allura. Kinda salty about how s8 ended. Yeah I was sad to see Lance had grown so much and fallen in love with Allura only to have to die to save everyone. I’m with you on the ending. At least we got a show that really went deep with characters. class="post-template-default single single-post postid-12238 single-format-standard samba_theme samba_left_nav samba_left_align samba_responsive wpb-js-composer js-comp-ver-5.7 vc_responsive"